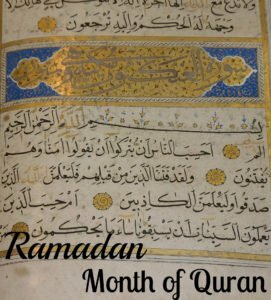 Ramadan Preparation - Simple Strategies and Free Resources. Get ready! Ramadan preparation for your best Ramadan EVER with simple planning strategies, goal setting, and using free resources! Get ready NOW for your best Ramadan! How will you feel when you welcome Ramadan? Are you prepared to make the most of this precious time of the year? If you are anything like me you are probably not prepared! But let’s do this and start right here and now. Let’s make Ramadan count! 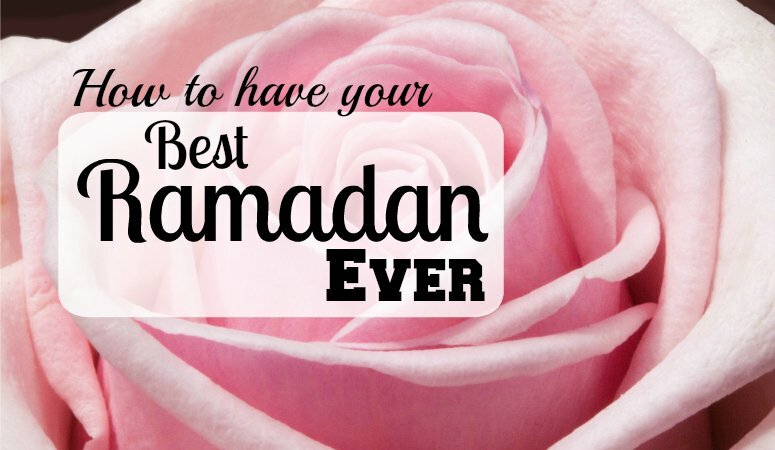 Prepare for your best Ramadan ever. Keep calm and welcome Ramadan instead of blundering into this sacred month. This is the one crucial step in powerful Ramadan preparation. The spiritual side of it. We are already in the middle of the holy months. A special time we should use for devotion, to retreat and remember. Use these days to put a little more effort into everyday devotions that may have become all too mundane. Give a little more thought to your actions. Pray with all your heart and add a little extra. Remember that our lives are at risk any minute. Are you prepared for the Hereafter? Now approaches the best time of the year to repent or change unhealthy habits. Decide to approach Ramadan intentionally and make the best use of these days. Take a minute to remind yourself that this life is not going to last forever. Only four days before the first of Ramadan we lost my dear mother-in-law in a car crash. She didn’t live to see another Ramadan. And none of us knows when his last Ramadan is here. My cousin was diagnosed with brain cancer recently. She passed away just days after I wrote this. We all know those stories. We need to live by them. Memento mori (Latin for “Remember your own lethality”) Do what you can to make the most of your days. Even if Ramadan preparation means taking baby steps. What about the last Ramadan? Did it go well? Or is there anything you would like to change about how you approached Ramadan? Are there mistakes you don’t want to repeat? (I sure have some!) Lessons learned? Or good things you want to implement permanently? If you will for some reason not fast, don’t think that Ramadan isn’t for you in that case. You can still do a lot!! Ramadan is not the month of fasting in the first place though many people think so. Ramadan is the month of Quran. And then the month of fasting. If you only fast you missed on a big thing! So commit to spending time reading and thinking about Quran for your Ramadan preparation. When you pray ask God to let you live to see Ramadan. That’s what early Muslims did, too. Add some Dua, invocations, to your mandatory prayers or praise God more often. Try to find more peace and concentration when praying or reading scripture. Watch out for things that drain your energy and concentration and drive you away from praying and contemplation. If you want to move closer to God try to make extra time each day to have a quiet reading time. Read Quranic scripture or Tafsir. And then think about what you have read. Many people read a biography of the Prophet Mohamed’s life before or during Ramadan. It is also a great idea to read about other Prophets’ lives so you can use them as a role-model or remember what many of them have gone through. Of course, it is always helpful to read anything regarding Ramadan and the rules of fasting. Try to find something you didn’t know and revive what you have learned. If you don’t have a well-assorted home library, don’t stress. You will find a lot of books in ebook/pdf format online for free. Among them are many classic reads for Muslims, e.g. the stories of the Prophets by Ibn Kathir. Now that you have prepared spiritually you are ready to get into planning and goal-setting for this year’s Ramadan. Create a vision of what you want to accomplish. Set a theme to focus on if you want to. Plan what you want to achieve in Ramadan, what you want to do more, or stop doing, create a reading schedule or plan a family gathering. Use Ramadan or the celebration of Eid al-Fitr at the end of Ramadan to invite neighbours and friends to your home. Think of presents for your children. Print out a free daily planner to create the perfect Ramadan day and try to stick to it. If it’s more convenient create a weekly schedule especially for Ramadan. There are many free out there and I LOVE the ones by Eliza Ellis, e.g. free Irma Weekly Planners or free Daily Planners that come in 6 colors and different layouts. Some layouts include a to-do-list or habit tracker. Great for Ramadan if you ask me! If you have a written plan in place you have done a crucial step to set yourself up for success! Try to find an accountability partner and keep yourself accountable with prayers, too. Get a 30-day habit tracker to motivate yourself to stick to your plans. Choose one that has a nice design you like to look at and that gives you some space to fill in your plans. You can find trackers for one habit or those that let you track 4 habits on a planner page at the same time. This year I go with this 31 Day Habit tracker that allows you to fill in up to 15 habits. (And it is available in different formats) By the way, in a summer-Ramadan, you might want to get yourself a water drinking tracker, too. 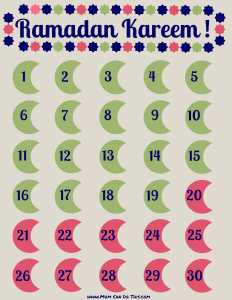 Print out a tracker to count down the days to Ramadan, mark days left until Ramadan on your calendar or use a digital countdown on your phone or desktop. Keep yourself reminding that Ramadan is around the corner. (Or as we say in German, Ramadan stands right in front of the door.) Ramadan preparation is now! As a subscriber, you will find FREE Ramadan printables in the insider-only resource library. Download and print yours today. Use them to make Ramadan more “visible” in your home. You will also find a Ramadan Bunting printable to craft an easy Ramadan decoration. Grab a pen and paper, use a printable or Evernote file and get to work. Repeat after me: I will make this Ramadan the best ever! Yay! If you are anything like me you want it all, now and immaculate! As a recovering perfectionist, I have to keep reminding myself that I cannot do it all! Ramadan is not about a sparkling clean home, fancy decorations, binge eating, pin-worthy buffet tables, 1001 homemade cookies, and cute gift bags or anything like this. Keep it simple and focus on the important stuff. You want to obey God, please Him with worship, move towards Him and away from your sins and weaknesses. Nice food is the cherry on top but it is not essential for a good time of Ramadan. Focus on what matters most, do less. Make that count and then, if you have margins, pursue what you want additionally. But keep your eyes on the goal to provide for the hereafter and not your tummy. Fasting in Ramadan isn’t easy. It is exhausting, physically and mentally, and meant to be challenging. There are good reasons why it is only for those who are grown and healthy, both physically and mentally. You will definitely enjoy your fasting days more if you are in your best shape. In your Ramadan preparation, hydrate and keep a drinking journal, use a free printable water tracker (like this one by Clean Mama) or a free water drinking app. Eat good, real food and cut back on sweets and sugar-sweetened or caffeinated beverages. Keep your lunch light and have a healthy dinner. If you struggled with some medical issues lately go and see your doctor to check of fasting is ok for you right now. Get a good night’s rest and maybe track your sleep, too. Get familiar with sleeping hacks to manage your energy better for the exhausting time to come when you get up at night and still work the entire day trying to manage everything on your plate and keep the kids happy, too. Maybe you try an app like sleep cycle to get up easier. Check your freezer, discard rotten items and note what is in stock. Then fill your freezer with more food. It’s a perfect time to build a no-refrigeration baking pantry. Learn how to build a baking pantry from scratch, what to put in there, and how to keep your baking pantry clean and organized in this post. Sign up for the newsletter and download the free ebook about baking anything anytime to learn more about freezing food and baking hacks! Clear your schedule in Ramadan from unnecessary things to have more time for devotions or rest. Schedule appointments before or after the holy month. Especially, clear the last 10 days of Ramadan so you can have a little retreat to concentrate on worship and reading as much as you can. I know as a homemaker and mother this is not easy. God knows your struggles. Try and do your best, even if you only have an hour of uninterrupted time. Make that time count. Make sure it is not drained by mundane tasks or watching series only. Although I know better one of the biggest mistakes I repeat over and over again is shopping for too much food in Ramadan. I love to go out, get inspired and get myself a whole lot of sweet treats. Not only does this lead to food waste, ouch, but it stresses the budget a lot. So, this year I try to take meal planning seriously in Ramadan and shop accordingly. Yes, sweet treats are allowed, but limited. If you usually don’t plan your meals try to do it in Ramadan. It will help you decide what to buy and how much. 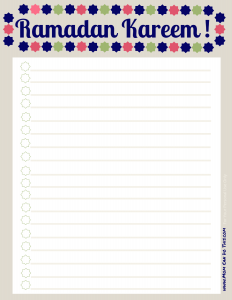 Print out a cute and free meal planner in a monthly layout to cover the entire month of Ramadan. Your meal plan will also allow you to set up a food stock in advance. I usually only plan dinner. But my Ramadan meal plan has to take into account that we have only a few hours to take in all calories, nutrients, and water we need. So we make rich smoothies each Ramadan night and I need to shop for those, too. Snacks have to be nutritious and healthy. Instead of our weekly eating out day, we have a weekly delivery day in Ramadan. And of course, you need everything for Breakfast/Suhoor at home. No chance to grab a snack at the bakery later. In addition to meal planning, try at least a simple form of budgeting for Ramadan. Days can get long with lots of temptation to go and do this or that, spending on fun things or food. Plan how much margin there is for fun activities, the Eid party, invitations, treats, and new clothes for Eid. Around this time, I try to put more cash into my Ramadan Change trap to have some extra, especially for Eid presents for my little one. Approaching Ramadan with the right mindset and a bit of preparation will enable you to make the most of your Ramadan days and improve yourself beyond Ramadan. What is it that keeps you from having a great Ramadan? Do you struggle sometimes? What area do you focus on this year? Are you already in Ramadan preparation? I would love to hear about it! Have a great Ramadan preparation! German-speaking Muslims, check out the “Ramadan Leben” self-paced online course to have your Best Ramadan Ever. (This is an affiliate link. See full disclosure here.) It’s a 9 module online course to make the most of Ramadan, it’s in German, though. You will have lifetime access and free updates. I’m going through this course the third time right now.